The maximum temperature on Tuesday was 41.2ºC and the minimum 27ºC. The maximum relative humidity was 32 per cent and the minimum 13 per cent. Rainfall: Light rain and thundershowers have been reported at a few places in Haryana and at isolated places in Himachal Pradesh, Punjab and east Rajasthan. Weather was mainly dry in the rest of the region. Temperatures: Past 24 hours change: Maximum temperatures changed little. Departures: They were appreciably above normal in Haryana, Himachal Pradesh, Punjab and Uttaranchal, above normal in Jammu and Kashmir, Rajasthan and east Uttar Pradesh and normal in west Uttar Pradesh. The highest temperature in the region was 46°C recorded at Churu (Rajasthan). Forecast valid until the morning of May 22: Rain or thundershowers are likely at a few places in Himachal Pradesh and Jammu and Kashmir and at isolated places in Punjab and Uttaranchal. Isolated dust storm or thunderstorm is likely in Haryana, north Rajasthan and Uttar Pradesh. 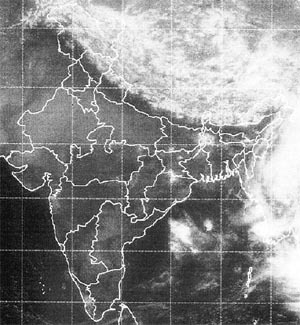 Weather will be mainly dry in south Rajasthan. Forecast for Delhi and neighbourhood valid until the morning of May 22: Mainly clear sky with dust haze. Dust storm or thunderstorm accompanied with squall is likely in some areas. Maximum temperature will be around 42°C. Farmers’ weather bulletin for Delhi forecast valid until the morning of May 22: Dust storm or thunderstorm with light rain is likely at a few places. Squall with wind speed exceeding 65 kmph is likely at isolated places.